This is a post sent from my friend Johan from Netherlands. Great, that you share your work with others! Just like the ASRock N3150 there are a lot of cheap computers based on the Celeron chipset. I happened to find and buy one in China, based on the earlier Celeron J1900 chipset. The Qotom system has four gigabit ethernet ports (based on an Intel chip), 8 Gb of RAM and 120 Gb mSata drive and passive cooling. This is an ideal system for a small firewall appliance. My intended target was install ESXi to run Sophos XG UTM and pfSense (ipv6) virtual machines on it. And yes, I knew that this hardware is not on the compatibility list of VMware. When first trying to install ESXi 5.5 I hit the dreaded „Relocating modules and starting the kernel“ message and seemingly nothing happened. Then I found this blog (and some new inspiration). Option 3 (IPXE) seemed like the best solution, but it failed with an CRC error. In hindsight, this is probably caused by the mSATA drive. After contacting Antonio he gave me some new pointers, this gave me some new inspiration to keep on trying. Then I tried Option 4 using the modified ISO of ESXi 6 Antonio sent me. Installed it on a USB stick using VMWare workstation. I did configure four ethernet ports in the VM, just like the real Qotom system. Booted the Qotom system (after setting the BIOS to legacy and setting the USB stick as the primary boot device) and the device seemed to boot, but still got the „Relocating modules and starting the kernel“ message. But no indication if anything was working. I had a look in my HP smart ethernet switch that the Qotom system was connected to, but it listed no new MAC address being registered at the switch. So there I was, having learned a lot, but still no working system. As a sort of last resort, I started moving the Ethernet cable from one port to the next. And suddenly when I plugged in the SECOND port a new MAC addres was registered at the switch. Opened the newly assigned IP address and there it was: the ESXi 6 status page, success! I could even managed it using the new web based user interface. So this was the real trick: not the first ethernet port of the Qotom device is activated after an ESXi install, but the SECOND ethernet port is. Since I used ESXi 5.5 for other (test) systems in my home I did it all from scratch again, using my own modified ISO of ESXi 5.5. This creates a ’slipstreamed‘ ESXi 5.5 ISO with some additional modules. Sata-xahci is needed to recognize the mSATA drive. Using this ISO I installed it on a USB stick using VMWare workstation, and booted the resulting USB stick from the Qotom system. Of course this time the second ethernet port was attached to my network switch. Succesfully opened the assigned IP address in the vSphere Client and could see ESXi 5.5 running happily. Hopefully this is useful to other readers with a similar J1900 based system. Let me conclude by thanking Antonio very much for all his quick reply’s and extensive pointers. I would never have persisted without them. So while this post was helpful it didn’t get the job done for me. I bought the same machine because I have deployed it before as a pfSense/Unifi controler box for a relative. It has great potential but really lacks support. When I found this post I was hopeful of creating my esxi deployment for my router/home lab but none of the methods worked for me, although I didn’t try the 4th option from Antonio’s post. I wanted it installed on the 1tb HDD that came with it. iPXE booting wouldn’t work after several times using both my own iPXE boot file and Antonio’s. This unit doesn’t have the serial port so I skipped that. I tried every combination of scripted install to no avail, I thought it was installing because there was a lot of disk activity but it never worked. So I spent most of my day Saturday trying different thing’s to get around the „no graphics driver support“ that makes it impossible to install this. If you don’t have a mSata drive, the HDD drivers on the standard ISO are fine, also the intel NIC drivers work. If you do have mSata you’ll need to build your own ISO(as I did) to include the drivers(joahn describes this). So what finally worked? I have an Intel based desktop that I work on daily, and I thought „well esxi doesn’t require installing specific drivers, they all come pre installed in the ISO and at boot it decides what drivers to use, what if i stick the disk in my system and install then put the disk back?“ 20 minutes later I had a working system! So for those of you who spend a while to get this working, if you dont mind cracking open the side of your desktop and moving the disk over for a few minutes this was a quick and easy way. I have a hot swap bay that made it even easier for me but still this only took a couple minutes of time off. Just make sure you configure admin access and your interfaces before you remove the disk and put it back in the Qotom box. Thank you Jon for sharing your solution. This post here was sent to me by Johan, Netherlands. The Qotom box seems to be tricky with ESXi. I’ve never owned such a system and the main solution I described on two other posts on this blog were made on N3150 / J3160 ITX Braswell platform computers. Anybody has been able to successfully upgrade to ESXi 6.5 on the Qotom Q190G4 (J1900)? I had it running smoothly under ESXi 6.0, but when I upgraded to 6.5, I lost (network) access to it. I have even tried a clean install with 6.5, but it didn’t work as well. Been trying to get it working with 6.5 for the past 2 days, but I’m clueless now. Any hints or tips? I asked Johan, who made this initial post. Did Fabio try plugging into different ethernet ports? The eth device numbering might have changed. Antonio… thanks for asking Johan about it. Indeed I had already tried plugging into all 4 ethernet ports and, unfortunately, this also didn’t work. I have also looked at the driver mapping on ESXi 6.5 (inside the NET_E100.V01 VIB) and the Device ID for the NIC is still supported. I’m trying to record boot logs to the USB drive (to see what may be happening) but I haven’t got much success with this yet. When using the USB drive plugged to the VM, it records the logs in the drive, but when I connect it directly to the Qotom mini computer, no logs are recorded. Unfortunately I haven’t had much time to play with it this weekend. Have you upgraded your ASRock N3150/J3160 to ESXi 6.5 yet? If so, how did it go? Also wenn ich das richtig verstanden habe, kann ich die Standard ISO nehmen, wenn ich ESXi auf die SATA Platte installieren möchte. Oder soll ich die Platte in meinen Desktop einbauen, dort installieren und dann wieder in die Box. Daniel, das Problem ist, dass die Grafik in N3150/J3160/J1900 Systemen nicht vom ESXi Installer erkannt wird und deswegen man nach der Meldung „relocating modules“ nicht weiterarbeiten kann. Man muss aber mindestens das Management Netzwerk einrichten, das root Passwort eingeben und SSH freischalten, um das System auch ohne lokale Konsole aus der Ferne zu administrieren. Wir zeigen hier, dass das in vielen Fällen trotzdem auf diesen sehr preiswerten Severn funktioniert. –> Installation der SATA-Platte auf einem anderen, ähnlichen System, dann Platte tauschen. Von ISO DVD direkt auf Festplatte installieren, klappt i.d.R. nur bei Systemen, die von VMWare freigegeben sind und auf der HCL sind (hardware compatibility list). Welcher Weg bei dir funktioniert, musst du ausprobieren, das ist vor allem eine Frage der verbauten Hardware, insb. der LAN Controller. Have you tried to install ESXi inside a VM on your destination computer? is it must use a vm inside the destination machine any other method to direct install the esxi to the pc ? Direct install will fail on j1900 due to incompatible graphics. any chance to use instant install for j1900 quard lan model ? Can anyone help me to provide the USB boot image ? where is the Option 4 using the modified ISO of ESXi 6 Antonio sent me? Note: I couldn’t verify the last image (ESXi V6.5), because I have only one (productive) system. But I used the 6.0 image and did an successful update to V6.5. I use the v2 iso make a USB on Windows vmplayer but still fail during standalone boot up on the quard Ethernet pc but my notebook is able to boot up? This post here was originally written by my friend Johan from Netherlands. He has such a quad eth system. As a sort of last resort, I started moving the Ethernet cable from one port to the next. And suddenly when I plugged in the SECOND port a new MAC addres was registered at the switch. It appeared that this was a MAC address from VMware (probably as a result from the VMware workstation installation). Opened the newly assigned IP address and there it was: the ESXi 6 status page, success! I could even managed it using the new web based user interface. So this was the real trick: not the first ethernet port of the Qotom device is activated after an ESXi install, but the SECOND ethernet port is. Then the cap lock of keyboard is not function and I guess the system is fail to boot any other method to know the failed item during boot up? How long need to wait for „Relocating modules and starting the kernel“ in order to use IP to reach the ESXi? I think you should use an easy way and install your system via kickstart USB (automatic install). 3. Use portable Rufus to create a bootable USB stick (size >= 8GB). 4. Download boot.cfg and ks-nowipe.cfg from my blog and copy (replace) them on the USB stick. 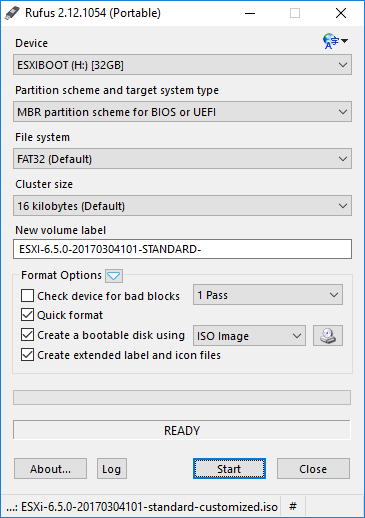 how to clone a bootable ESXi USB? I’m glad to hear that finally „after some hard days“ you made your system up and running. Only those who do not give up, win at the end. Congratulations! I’ll soon post a new blog entry with that USB stick installation procedure, so that also others can benefit from it. The USB stick can be easily created „just in time“ for some installation task, so no cloning is necessary, just create a new one when needed. I assume that you have installed the system on a hard drive or SSD and not on the USB stick itself, right? installed VMware player, and hooked the SSDinto a spare sata bay. setup the VM and after remove the disk image file, and replace it with physical disk, ie; the ssd. boot up VM, run through install, reboot, set up static IP on NIC, then shutdown. move drive over to Qotom (either onboard sata, or as i’m doing for now, usb-sata adapter) and power on, be sure to hit Shift+O and enter ignoreHeadless=TRUE because the host boot still hangs at „relocating…“ This is because, as far as i can tell, the integrated graphics on these are incompatible with ESXi, however the web interface still loads just fine. after reboot, i also got a 503 error, but reloading it after a minute or so it went away…? now to wait for my mSata drive to come in the mail, and build my own iso for it, should be fun. Hi, I just purchased a QOTOM Q190G4-S02 and trying to install ESXI. I tried every sugested step on the post with no luck. Can someone pls help me. Thanks. can you please post some more details? What exactly is not working? It works with a newer ESXi ISO file (V 6.5) which has less problems with VGA screen and ‚relocating modules‘ message ending with frozen screen. 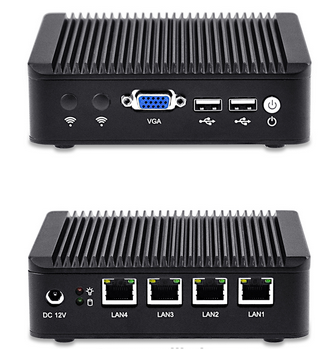 If installation is working, but there is no network connectivity, you have to know that QOTOM Q190G4-S02 uses an Intel Quad Ethernet NIC I211-At (details here: http://www.qotom.net/goods-129-QOTOM-Q190G4+4+LAN+Mini+PC.html). is there a way that we cat set „ignoreHeadless=true“ in the kickstart file? Save it, and now your base installer will always run with this command. When installing without kickstart, you can press tab while booting ESXi to enter this setting. Thanks for the reply. I was able to get the ESXI installed on my QOTOM Q190G4-S02. I was missing a detail when installing the iso to the usb disk with vmware player. I was selecting the USB drive from my host pc insted of adding a USB to the virtual machine and attaching my usb to the virtual machine. Once I did it the correct way it all came together. Now I am looking a way to do a „clone“/copy my bootable ESXI USB drive. Any recommendations? You asked me, how to clone the USB boot stick. With the kickstart installation, the ESXi Host partitions can be placed on SSD, no more stick is needed.